The next Lakeside Research Days will be about “communication in swarms” in July 2019. Aymen Fakhreddine and I will do a panel on drone networking at IEEE WCNC 2019. Gave an invited talk at Trinity College Dublin in December: “Self-organizing synchronization: From metronomes to robot swarms”. Moderated a panel on 5G. Udo Schilcher gave a talk on interference in wireless networks at TU Dresden in November. Samira Hayat participated at the Falling Walls event in Berlin in Oktober. Pasquale Grippa gave a talk about drone delivery at KAUST in October. Samira Hayat participated as invited guest at the Goalkeepers event by the Gates Foundation in New York in September. Participated in panel at European Wireless 2018 moderated by Giuseppe Bianchi: “The future of wireless research”. Self-organizing synchronization: From metronomes to robot swarms. Invited talk at Trinity College Dublin, December 4, 2018. Self-organizing synchronization in networked systems. Invited talk at International ITG Conference on Systems, Communications and Coding, Hamburg, February 7, 2017. Self-organizing synchronization: From fireflies to wireless systems. Invited talk at VDE Workshop “Self-Organization: Opportunities and Challenges,” Stuttgart, Oct. 7, 2010. Self-configuration and self-organized synchronization in communication networks. Invited lecture at TU Ilmenau, International Graduate School on Mobile Communications, Jan. 25, 2010. Further invited talks and lectures on self-organization and synchronization were given at Vrije Universiteit Brussels, TU München, Universität Passau and Universität Wien. Photo by N. Alt and F. Brandi da Silva with kind permission from Jörg Eberspächer (TUM). Mission planning in networked drone systems. Pasquale Grippa with Christian Bettstetter at Summer School on Emerging Technologies for 5G and Internet of Things, Thessaloniki, July, 8-10, 2017. Drone-based delivery services. Invited talk at Austrian Computer Science Day, Vienna, June 20, 2017. Networked drones: The hype is ripe. Invited keynote at European Wireless, Dresden, May 18, 2017. Wireless communications and job selection in networked drone systems. Invited talk at Centre for Aerial Robotics Research and Education, University of Toronto, April 27, 2017. Acting things. Panel discussion about self-driving cars, autonomous drones, and intelligent public transport. Stefan Poledna (TTTech), Manfred Gruber (AIT), and Christian Bettstetter (Uni Klagenfurt, Lakeside Labs) at IMAGINE, Metro Kino, Vienna, June 11, 2015. The drones are coming. Aerial imaging for disaster response. Invited talk at Alcatel-Lucent Stiftung, Association of Towns and Municipalities, Berlin, June 17, 2013. Autonomous networked microdrones. Invited keynote at TU München, Colloquium in honor of Jörg Eberspächer and his successor Wolfgang Kellerer, Dec. 07, 2012. From killing to healing: A tool called ‘drone’. Samira Hayat at re:publica, Berlin, May 10, 2017. Samira Hayat shares her personal experience with both military and commercial drones. “For me, technology is like a tool, you know. It does want the user wishes it to do,” she says. It is in the hand of humans “whether they go rogue or stay ethical.” She also quickly explains our research activities on networked drones in Klagenfurt. re:publica is an annual conference and exhibition on the digital society with about 9.000 visitors. A full stream of Stage 2 of Day 3 is also available. Safe-saving drones. Samira Hayat at the 2016 TEDx event at CERN, November 5, 2016. “Drones can be used for many different purposes, but I believe that the transition of drones from ‘killing machines’ to ‘healing machines’ is truly in progress,” Samira Hayat says. In her TEDx at CERN, she highlights some application domains where drones act as human-friendly devices. CERN is the European Organization for Nuclear Research; it is one of the world’s largest research centers. 5G: Opportunities and challenges. Panel with Aneta Baier (Institut für Rundfunktechnik), Christian Bettstetter (U Klagenfurt, moderator), Driton Emini (T-Mobile Austria), Frank Fitzek (TU Dresden), Hermann Hellwagner (U Klagenfurt moderator), Wolfgang Rauter (A1 Telekom Austria), and Thomas Stockhammer (QUALCOMM), Klagenfurt, November 30, 2018. The future of wireless research. Panel with Giuseppe Bianchi (Rome, moderator), Christian Bettstetter (Klagenfurt), Frank Fitzek (Dresden), Tommaso Melodia (Northeastern), Emilio Calvanese Strinati (CEA-Leti, Grenoble) at European Wireless, Catania, Italy, May 4, 2018. Stochastic modeling of wireless networks. Invited half-day tutorial at GREENET Initial Training Network, Munich, Jan 8, 2014. With Udo Schilcher. On collaboration between industry and universities. Infineon’s CTO, Reinhard Petschacher, and the two professors Mario Huemer and Christian Bettstetter discussed about the topic of cooperation between industry and universities. How does cooperation start? How are win-win situations achieved? What are sensitive issues in such collaborations? The discussion is part of the book Wissen schaffen, which illustrates the variety of research activities at the University of Klagenfurt. 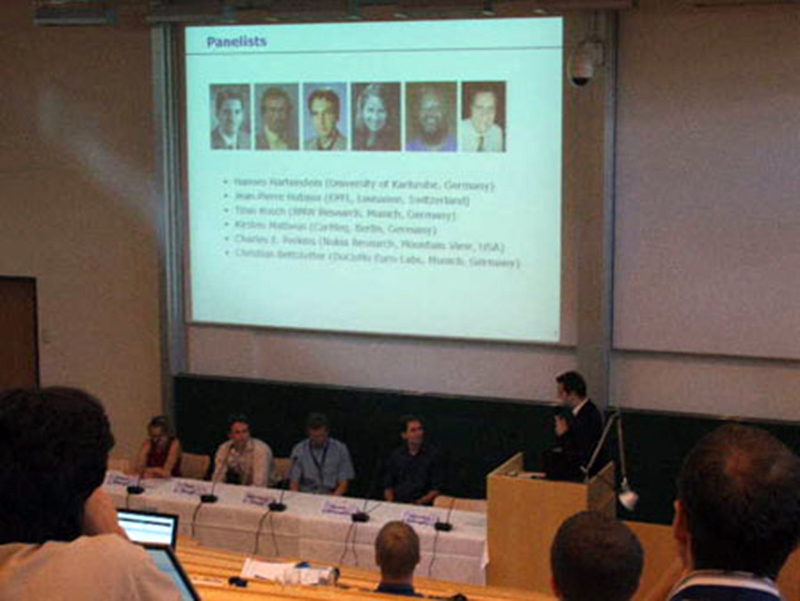 The panel was held at Infineon Villach, July 22, 2009. In German. The human side of research (Forschung wird von Menschen gemacht). Keynote speech at the event Operation Research: Research and innovation interacting with the entrepreneurial landscape, Klagenfurt, June 2, 2008. Laudatio for Johannes Huber. The University of Klagenfurt awarded an honorary doctorate to Johannes B. Huber (Erlangen). Christian Bettstetter had the honor to introduce him. Klagenfurt, November 17, 2017. Self-Organizing synchronization and probabilistic flooding in communication networks. TU München, Seminar in Communication Networks, November 2, 2009. Die Vernetzung der Dinge. Evening talk at the opening of Lakeside Labs GmbH, Klagenfurt, Austria, Feb. 7, 2008. Paradigmen zur Vernetzung der Dinge: Über Relays, XORs und Glühwürmchen. Inaugural lecture at the University of Klagenfurt, Sept. 27, 2007. Ad hoc networking: Connectivity analysis and use of adaptive antennas. University of Klagenfurt, Colloquium on Mobile Systems, Austria, Jan 2005. Vehicular ad hoc networking. Panel with Hannes Hartenstein (Karlsruhe), Jean-Pierre Hubaux (EPFL), Timo Kosch (BMW), Kirsten Matheus (CarMeq), Charles E. Perkins (Nokia), and Christian Bettstetter (DOCOMO), Klagenfurt, July 15, 2005. Ad hoc networking. Half-day tutorial at Intern. Workshop on Mobile Multimedia Commun. (MoMuC), Munich, Oct 5, 2003. With Hannes Hartenstein and Martin Mauve. From 2G to 3G: The General Packet Radio Service (GPRS). Half-day tutorial at Intern. Telecommun. Network Planning Symp. (Networks 2002), Munich, June 23-28, 2002. With Jörg Eberspächer. General Packet Radio Service (GPRS): Mobility and session management. Talk at VDE/ITG Workshop “IP and Mobility,” expert group 5.2.4, Kamp-Lintfort, June 20-21, 2001. Swarming in cyber physical systems (2017): The 2017 Lakeside Research Days were held as a three-day interdisciplinary workshop on self-organization and swarm intelligence in cyber physical systems. Experts presented their work and discussed open issues in this exciting field. Keynote speakers were Nora Ayanian (assistant professor at the University of Southern California) and Gianni Di Caro (associate professor at Carnegie Mellon University). Two additional highlights were the presentations by Johannes Gerstmayr (professor for machine elements and design at the University of Innsbruck) and Thomas Schmickl (professor for biology at the University of Graz). The program also included laboratory sessions with training on micro-robots and talks from the Horizon 2020 project CPSwarm. Multi-UAV systems (2013): The 2013 Lakeside Research Days focused on systems with multiple unmanned aerial vehicles (UAVs) aka drones. Invited experts and young researchers discussed their ideas and exchanged experiences. The full-week event organized and chaired by Evsen Yanmaz and Christian Bettstetter featured keynotes by Roland Siegwart (ETHZ), Angela Schöllig (Toronto), Simon Lacroix (LAAS), and others. It also included a panel discussion on business opportunities and several group work sessions. Some participants later wrote an article on the design of UAV communications for the IEEE Communications Magazine. Robustness in self-organizing systems (2009): The 2009 Lakeside Research Days chaired by Christian Bettstetter and Wilfried Elmenreich focussed on robustness in self-organizing systems with experts from this domain. Invited speakers included Francis Heylighen (Brussels), Raissa M. D’Souza (UC Davis), and Marc Timme (Max Planck Society). Some participants wrote a survey paper and a proposal for a joint Europan project. Others collaborated and published in the field of robust self-organizing synchronization.